Family friendly yacht charter holidays in Greece. The Greek islands offer some of the safest sailing areas in the world and are renowned for their unique and varied charm offering something for every age and ideal for family friendly yacht charter holidays. The Greek people are some of the most warm and friendly in the world and they absolutely adore children! Wherever you go on your family yacht charter sailing holiday you and your whole family will be welcomed most warmly. The food in Greece offers something for every taste and is fresh, healthy and wholesome. Fresh fish or pasta, beautiful traditional local cuisine or pizza, not to mention fantastic ice creams for the children and refreshing local beer and regional wines for parents you will find something tasty for all the family. And, if you want some help in your first few hours or days whilst you wind down and settle into your Greek islands sailing holiday we are always happy to help. 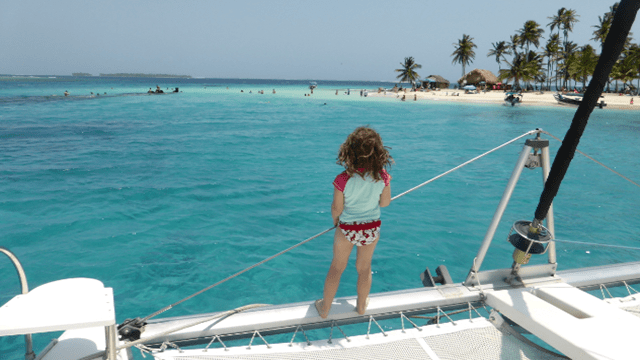 If you want advice or information about the best places to explore with the family or would benefit from one of our friendly skippers for as much or as little time as you want just let us know. We can provide fun and friendly tuition in any aspect of Mediterranean sailing including stern to mooring practice and have plenty of ideas on the best places to visit so that you have a fantastic, fun and safe family sailing holiday in Greece. The Ionian island sailing areas are perfect for family yachting holidays with so many safe bays to anchor off in and friendly town quays to visit. Greek Ionian sailing conditions are extremely family friendly in the Ionian with light, consistent and steady winds there is plenty of fun sailing to be had without the need to worry about anything too challenging coming your way. The Ionian sea is a great place for children (and adults) to learn to sail and for parents to enjoy the sailing conditions, explore and relax! Typically winds build about lunchtime and drop again at sunset. This means that you can spend the morning sailing gently to a lunch time stop, such as a secluded bay, and go for a swim or snorkel, have lunch on board and then have some fun sailing to your evening destination. The winds are fairly consistent throughout the Greek Ionian and usually result in a very calm evening, at night the winds usually die right down leaving the water looking like a mill pond. If you chose a family friendly yacht charter holiday in Greece navigation is simple and stress free and due to the close proximity of the islands dotted throughout the Ionian navigation is predominantly by sight with almost no tide or currents and very few hazards. With brand new, state of the art chartplotters on deck on all the yachts you can concentrate on having fun sailing, swimming, snorkeling or just relaxing in the many beautiful Greek Ionian anchorages! 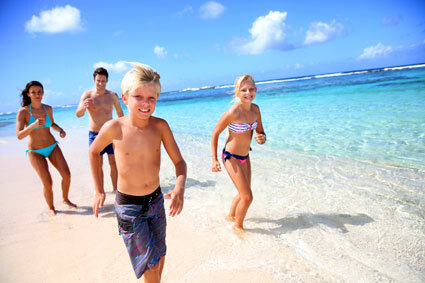 Family sailing holidays are a perfect holiday for young children, teenagers and parents alike. Each family member can choose whether they want to play an active part in sailing or equally do nothing at all and relax on the bow of the boat while reading a good book. Once in port or at anchor the more active family members can explore the new surroundings on land or by snorkelling around the boat while the rest of the family can either relax on the boat or at a local taverna reading another book!